If you are looking for corporate award trophies or corporate plaques then Cherokee Trophies is your one stop shop. In business for over a decade, we specialize in Trophies, Plaques, Resins and Acrylic Awards. Your satisfaction is our #1 goal. Cherokee Trophies offers corporate award trophies which is ideal for your next meeting. Reward your number one employee with a plaque today. Whether its school, baseball, or corporate awards we can do it all!! One of our specialties is corporate plaques and school awards. We also offer corporate trophies with many different designs to choose from. If you are looking for that perfect award to honor a star student we have various academic awards featuring chess awards, spelling bee awards and music awards. 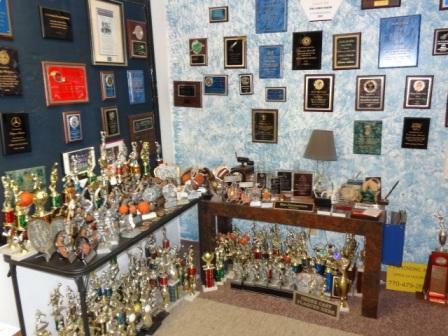 Cherokee Trophies features all the sporting trophies, plaques and medals that you will need for any season. We offer awards for wrestling, basketball, baseball, swimming, tennis, track as well as coach awards. All Customization of products is done in house. We want to make sure you can order exactly what you need for that car show, sports banquet or employee that really stands out. In addition we custom engrave the perfect toasting glasses for your upcoming wedding. Whenever you are looking for trophies, stop by our showroom Monday-Friday 9 am to 5 pm or anytime on our website.